Our project of building a hybrid GPU-CPU cluster is financed by the Croatian Science Foundation. The project has been funded for one year and here you can find the final report to the Foundation. The report describes what we have done and the problems we encountered during that period. It also provides details on the financial aspects of the project. The Large Synoptic Survey Telescope project (LSST) is the most ambitious ongoing project in the US astronomy. For the first time, the LSST will provide time-lapse digital imaging of faint astronomical objects across the entire sky. The LSST has been identified as a US scientific priority in reports by diverse national panels. In the end of 2009 we received a sub-award from the LSST, under which they co-finance one programmer for a year. The work on Hybrid that led to this sub-award started already during the testing phase of our cluster. This initial work focused on speeding-up the code that calculates realistic distribution of stars in our Milky Way galaxy and creates a catalogue of stars that a telescope would see. The work was initiated by Mario Jurić (Harvard University), the co-PI on the Hybrid project. He worked with Krešmir Ćosić, our project assistant. The total runtime was shortened by a factor of 200 thanks to GPUs. 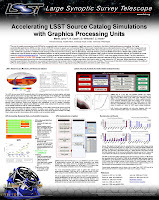 This success attracted the interest of LSST, because GPUs could be of a great help in their efforts to produce simulated images for the future LSST telescope. Currently it takes a week to run one LSST simulation on CPUs. This led to an official collaboration agreement with the LSST Corporation to work on adapting parts of their code to work on GPUs. These first results on improving the Milky Way simulation code are going to be presented at the 215th American Astronomical Society Meeting in Washington, DC, in January 2010.